The Stallions raced out to a 49-7 halftime lead, en route to a 55-13 win. Senior running back Alonzo Booth needed just 14 carries for his 164 yard, four touchdown night as he passed Dino Razzano '03 to become the school's all-time leading career rusher. The Stallion defense held the Generals to 123 yards and forced three turnovers. Ryan Corkrean recorded an interception and also had a 53-yard touchdown reception. Quarterback Cole Silvestri rushed for a touchdown and threw for another score. Alonzo Booth rushed for 228 yards and four touchdowns as the Stallions advanced to the Region 11 Final. The Stallion defense held the Cougars to 1-for-10 on 3rd down conversions and were led by Drew McLuckie and Joey Velazquez's 8 tackles each. Due to a power outage on gameday at Westerville Central, the location was switched to Westerville North. The Purple and White improved to 16-5 all-time against the Cougars. In the first meeting between the two schools since 1978, the Stallions scored 21 points in the 2nd and 3rd quarters to build a 49-0 lead and would go on to win the school's 11th Regional Championship. 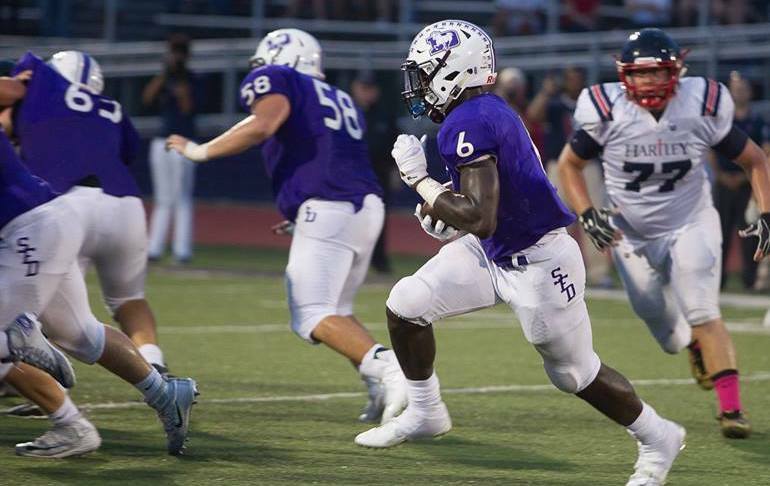 Alonzo Booth started things off with a 98-yard run early in the opener quarter and it was the first of four scoring plays of 50 yards or more for DeSales. Joe Arnold caught a 51-yard pass from Cole Silvestri and returned a fumble on offense 55 yards for another touchdown. Silvestri connected with Jared Noble for 50 yards and also had a 21-yard score on the ground. Derrius Mullins led the Stallion defense with 10 tackles as the Purple and White held the Rangers to 53 yards rushing on 26 carries. Ryan Corkrean tallied 8 tackles and returned an interception 39 yards for a touchdown. Akron Hoban, the defending Division-III State Champions, rallied from a 14-3 halftime deficit to hand the Stallions their first loss of the season. The Knights out-gained the Stallions 210-195. Linebackers Ty Van Fossen and Ryan Corkrean each recorded 12 tackles to lead DeSales. On offense, Alonzo Booth finished with 98 yards and touchdown. Van Fossen also scored on a 6-yard run in the second quarter. Hoban would go on to win the 2016 Division-III State Championship the following week, 30-0 over Trotwood Madison. The Stallions scored 21 points in the first quarter, as part of a 38 point first half, en route to a 38-7 win over St. Charles to clinch the 2016 Central Catholic League Silver Division Championship. Alonzo Booth had 168 total yards (102 rushing, 66 receiving), scored three touchdowns and moved into second place all-time with 1,623 yards for most rushing yards in a single season. Cole Silvestri connected with Booth (66) and Joe Arnold (50) for passing touchdowns as the Purple and White totaled 271 first half yards. The Stallion defense held the Cardinals to 31 yards of offense in the first half and Joey Velazquez had an interception return for a touchdown. It was the third straight CCL Silver Division Championship for Head Coach Ryan Wiggins and 7th overall (in 10 seasons) for the 1997 SFD alumnus. The Stallions outscored the Cardinals 98-7 in all three levels, including in Freshmen and Junior Varsity Football.